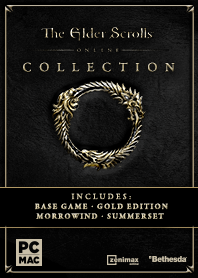 The ESO Collection was released on May 21, 2018 for PC and June 5, 2018 for consoles, however pre-orders were available beginning March 21, 2018 and gave immediate access to everything except Summerset. Those who pre-ordered also received the Queen's Bounty Pack and Nightmare Senche Mount as bonuses. The Elder Scrolls Online Collection is available from retail, the PC/Mac Store, Steam, the PlayStation Store, and the Xbox Store.